Mutual fund is a trust that pools and invests investors money to achieve a common goal. Income earned through these investments is divided in the ratio of number of units held by investors. Investors are beneficial owners of mutual fund in the ratio of their holding. Common goal doesn't always means maximum returns. This may be safety from market risks with normal returns. Can't reap benefits of intraday movements. Open ended funds are those in which units can be sell and repurchase at any time by AMC. In this type of funds units are sold only once at the time of NFO. Units are redeemed at the end of predetermined period. To provide liquidity , facility is provided to trade units in exchanges. These funds have advantages of both open ended and close ended funds. It has all the features of close ended funds but the fund opens for sae and repurchase for a certain interval. In he history of mutual funds, Close ended funds registered higher returns. Reason behind this fact is there is no need to maintain any liquid reserve to meet to repurchase of units. In equity schemes, fund manager invests funds in equity. High risk with high return is inherent nature of equity market. 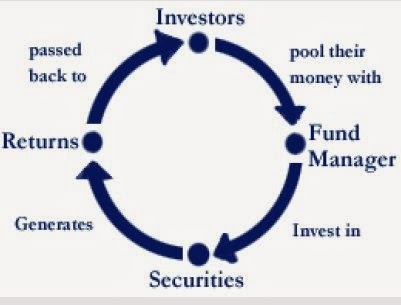 Fund manager need to invest at least 65% of the corpus in the equity market. Diversified equity schemes - In this scheme funds are invested across various sectors and companies on the basis of research and available opportunities. Sector funds - In this types of schemes, funds are invested in a particular sector. ELSS - In this scheme tax deduction of up to Rs 1 lac is available under section 80C of Income Tax act. There is lock in period of 3 years. Dividend and maturity value is tax free. Dividend yield schemes - In this scheme fund manager invests in high dividend yielding stocks whose value remain stable over a period of time. Arbitrage funds - These are low risk funds. They take benefit price variation across various markets. Arbitragers helps in bringing equality of prices of same stocks in different markets. For example if there is difference in prices across markets, then they will buy stocks where they are cheap and sell them at high price where they are expensive. Index funds - In Index funds fund manager tracks an index and invests according to it. Management expenses are low because investment decision is not made by fund managers and only job of fund manager is to track the fund. Goal of this fund is to achieve same return as of index, in case return varies, this is known as tracking error and fund manager fails to achieve the goal. In this fund money is invested in low risk debt instruments with return higher than traditional debt instruments such as post office deposit and fixed deposit in banks. Income funds - Invest in all types of debt securities and aims at regular income generation. Gilt funds - Invests in treasury bills and government securities which bears no risk and thus return is low. Fixed maturity plan - In this scheme fund manager invest in pre-determined investment options. Floating rate - In this scheme fund manager make investments in floating rate investments. Junk bond schemes - In this scheme fund manager invests in high risk low credit worthiness companies. Return is normally higher than market returns. Money market or liquid funds - In this scheme money is invested in short term money market instruments having maturity of less than 90 days. Balanced funds invests in both equity and debts. In offer document objectives of scheme are pre defined. Monthly income plan - This scheme aims at declaring dividend every month. Funds are invested in debt as well as equity investments. Capital protection schemes - This is a close ended scheme which invests in zero coupon government bonds which aims at capital protection. There are few more type of schemes that are very popular such as ETF, Gold funds, Commodity funds and International funds.